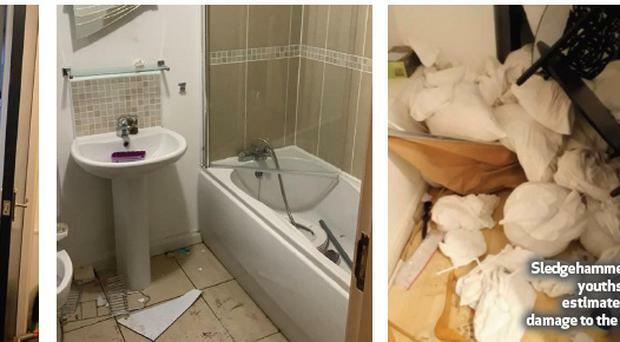 The manager of a luxury riverside apartment in east Belfast has spoken of his horror after his property was trashed by sledgehammer-wielding youths during a late night party - causing an estimated £40,000 worth of damage. Teenage vandals tore through interior walls, broke down doors, smashed windows and destroyed all of the furniture and household appliances in the high-end ground floor property beside the River Lagan. Terrified neighbours, who witnessed the carnage, said they feared their homes would be attacked and told how they frantically dialled 999 on several occasions but were forced to wait up to 40 minutes before armed police arrived on Saturday. The short term rental, reserved on accommodation website Booking.com, was made by a woman for her 16-year-old daughter. The girl then told friends, via Snapchat, she was hosting a party there that night. In a sinister twist, the letters 'SSH' - understood to stand for 'Short Strand Hoods' - were daubed on a wall inside the trashed building, while blood stains were also found on floors and other surfaces. At one point, up to 40 youths aged between 16 and 18 were seen scaling the railings to gain entry to the accommodation, which is normally let to corporate clients, foreign guests or tourists. The apartment manager William, who looks after several properties and did not wish his surname to be used, said it was "a shocking and mindless attack" that has made him reconsider whether to continue to offer short term lets. "I have never seen anything like this, the damage is horrific," said the shocked company owner. "Several windows are smashed, the kitchen's wrecked, two bathrooms are wrecked, all the furniture is wrecked. There's a hole in the wall from the kitchen into the hall... everything's ruined. It's a nightmare." He said he was taken aback by the scale of the destruction. "There was blood smeared on the wall and floor so obviously whoever did this hurt themselves in the process," he said. "It's a total mess. It's been described as a pre-arranged party that got out of hand. But it's going to take a lot of time and money to get the apartment back to the way it was beforehand. "We've been letting it out for two years without a hitch. We've hardly even had a broken plate or cup - and even then the client had sent a message apologising. "This is horrendous. The place just got completely wrecked." He added: "I've contacted Booking.com to report what happened. They've offered to waive their £9.80 commission, which isn't really going to cut it when I'm looking at tens of thousands of pounds worth of damage." William said it's the first time he's been "caught out" adding that, in this case, it was "by a local guest" rather than the "normal clientele" who "come from all over the world, week in, week out, without a problem". "I now know that a mother booked it for her daughter, who turned out to be 16," he said. "She organised a party on Snapchat, which everybody seemed to gatecrash, and when she asked them to leave they just wrecked the place. "It's a total mess. It's going to take a lot of time and money to get the apartment back to the way it was beforehand." He added: "We're completely out of action now. We've had to cancel tourists from all over the place for the next couple of weeks. This has really put me off short term rentals. I think we'll have to consider looking at long-term tenants only in the future." Yvonne Campbell, a businesswoman who lives in an apartment on the first floor of the complex, said she was at home when loud music began blaring from the courtyard below. She said the "deafening noise" preceded "what can only be described as an indoor riot" which kicked off shortly before 10pm. "I was extremely afraid for my safety," she said. "It was an immense relief when armed police finally turned up. Nothing like this has ever happened here before. Nobody in the apartment block can believe it." A male apartment owner, who asked to remain anonymous, said: "Someone was running around with a sledgehammer. The police did send an armed response unit in the end but there was plenty of time for them to wreck the place beforehand." A PSNI spokesman said police "are investigating a report of criminal damage being caused to an apartment in the Short Strand area of Belfast on April 13". "A 16-year-old female youth was arrested by police and has been released on bail pending further enquiries," he said. Addressing the time taken to arrive, the spokesman said police "prioritise response according to risk to life and vulnerability at peak times where we see increased incidents or calls for assistance". He said: "Police initially received a call about a noisy party and a group of youths climbing into and out of a garden at 21.56 hours. Around that time, police were dealing with multiple calls for assistance across the city; carrying out enquiries in relation to missing people, attending domestic disturbances, assaults, concern for safety reports, an attempted suicide, road traffic collisions, and criminal damage are just some examples. "As police officers were being tasked to attend the initial call, we received a number of additional calls about a noisy party and suspected criminal damage in the area. Police officers arrived at the address at 22.26 hours." In an email, Booking.com told William to "please provide us with clear photos of the damage. If the claim is valid we will waive the entire commission fee for this reservation". Kieran Smyth, boss of Charterhouse Property Management, which runs the apartments, said it was an alarming incident. "Short term letting through these agencies are causing widespread concern with people who own apartments in Northern Ireland," he said.